A growing number of reports indicate that soy products may be helpful in prevention and treatment of cardiovascular diseases, inflammatory disorders, and cancer. The active components of soy that are thought to be primarily responsible for the beneficial actions are a group of isoflavones, of which one of the most important is genistein. The amount of soy isoflavones that appear to be helpful-based on laboratory and clinical studies-is about 60-180 mg/day. A range of 40-120 mg is typical of quantities consumed daily by many people in Japan, China, and Singapore. In these Asian countries, the consumption of soybean products is believed to be partly the basis of reduced incidence of colon, breast, and prostate cancers; the other major dietary factor is lower saturated fat intake. The typical American diet, by contrast, contains less than 5 mg/day of the isoflavones, obtained mainly from legumes, such as peanuts. Narula-Soy (known for its designer, Acharan Narula, Ph.D.) is a soy protein powder for making an instant beverage. 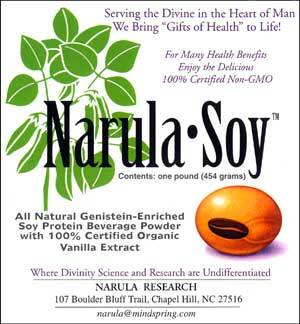 Narula-Soy contains added soy isoflavones, with 60 mg of isoflavones (~33 mg genistein, ~23 mg diadzein, and ~4 mg glycitein) in a serving of just one ounce of powder. It also provides 13 grams of protein per serving, without the soy polysaccharides that tend to cause indigestion and bloating when consuming whole soy products. One ounce contains, instead, 12 grams of easily assimilated maltodextrin and fructose. Further, the serving of Narula-Soy provides 175 mg of a mixture of phytate and soy saponins, which have antioxidant and other benefits. There are 16 one-ounce servings per can. The rich-tasting, natural vanilla-cream flavor powder is mixed with a small amount of water to make a paste and then it is diluted with water, milk, orange juice, pineapple juice, apple juice, or almost any beverage. By combining the tasty powder in a blender drink with, for example, yogurt and fruits, one can get a healthy amount of fiber, carbohydrates, vitamins, and beneficial fats. These figures show that while all three sources of nutrients are similar in number of calories (about 300), the Narula-Soy blender drink has significantly more protein than the others, with less carbohydrates than the tofu and rice meal (but 50% more isoflavones) and less fat than the canned nutrition drinks (which contain no isoflavones). On the next page is a brief review of the soy isoflavone benefits. Clinical studies reveal that soy isoflavones can play a role in the prevention of hot flashes and menopausal symptoms at doses of 40-80 mg/day. The isoflavones inhibit osteoporosis: the soy isoflavone daidzein is the biologically active metabolite of ipriflavone, a substance that has been available for the treatment of osteoporosis in 21 countries since 1989. Soy supplementation is not associated, however, with the full spectrum of estrogenic effects in women; for example, it does not appear to stimulate estrogen-dependent breast tumors. It has been postulated that this apparent contradiction may arise from different binding capabilities and different primary binding sites for phytoestrogens compared to estrogen. Soy protein lowers high cholesterol and is a good source of protein not accompanied by cholesterol, as occurs in meat, eggs, and milk. The soy isoflavone genistein has a number of properties that suggest its potential as an anti-atherogenic agent. The progression of atherosclerotic lesions depends upon lipid peroxidation, especially that of LDL (low density lipoprotein; a carrier of cholesterol). At a dose of about 60 mg/day of soy isoflavones taken for just two weeks, LDL develops considerable resistance to oxidation. Genistein is a potent inhibitor of the enzyme tyrosine kinase, and several of other contributors to heart disease, which may account for a lower incidence of heart disease among populations consuming soy products. The soy isoflavones inhibit cancer in laboratory studies. Genistein was shown to impair the growth of and promote the death of cancer cells, including cells involved in breast, prostate, and colon cancers. There appears to be a substantial reduction in breast cancer risk among women with a high intake of phytoestrogens, particularly isoflavones. In premenopausal women with regular ovulatory cycles, 45 mg of soy isoflavones given daily for one month significantly suppressed the mid-cycle surges of luteinizing hormone (LH) and follicle-stimulating hormone (FSH) and increased the follicular phase length: such an effect is considered beneficial with respect to risk of breast cancer. Genestein and daidzein may regulate the levels of estrogen and testosterone by inhibiting steroid biosynthesis enzymes, thus reducing risk of breast and prostate cancer. According to a study of soy isoflavone effects, it has been proposed that for significant anticarcinogenic effects, the dosage of the isoflavones should be about 1.5-2.0 mg/kg per day (for a 70 kg body weight, this is 105-140 mg). Genistein is a strong inhibitor of angiogenesis in laboratory investigations. Pathological angiogenesis is an essential component of many diseases, such as rheumatoid arthritis, psoriasis, solid tumors, hemangiomas, diabetic retinopathy, blindness, and chronic inflammation. Without angiogenesis, solid tumors (both sarcomas and carcinomas) cannot grow beyond microscopic sizes, and will remain dormant, or even regress. Genistein inhibits the production of interleukin-8 (IL-8) in human gastric epithelial cells (stomach lining) when stimulated by Helicobacter pylori, the bacterium species that is the major cause of chronic gastritis and is strongly associated with both duodenal and gastric ulcerations. The gastric lining, once infected with Helicobacter pylori, becomes infiltrated with inflammatory cells, including neutrophils and T-lymphocytes. IL-8 is a potent activator of the inflammatory cells, and is one of the key molecules responsible for the initiation of acute inflammation. Excess production of IL-8 has been reported in cells lining the respiratory tract, urogenital tract, and colon, where it greatly contributes to mucosal inflammation. It is possible that IL-8 contributes to the so-called "leaky gut syndrome."